Housewares Plus is a chain of retail stores specializing in selling kitchenware, tableware and home decor products at competitive pricing. 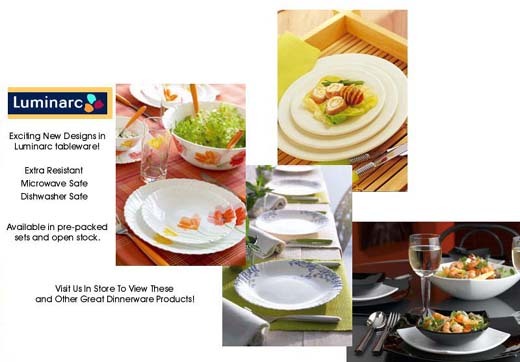 Housewares Plus boasts a large selection of dinnerware prints under one roof. We are your one-stop shop for tableware and crockery. Our Corningware line includes casserole dishes that are microwave safe, oven safe, dishwasher safe and stovetop safe. In addition to tableware and crockery, Housewares Plus offers kitchen utensils, bakeware, glassware and prepware. Visit one of our locations in the Greater Toronto Area to shop for these and many more products.